Pakistan - Interview - Blasphemy laws destroy lives! 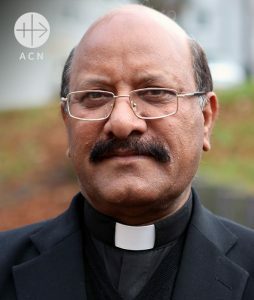 Dominican Father James Channan has been working to establish a dialogue between Christians and Muslims for years – in a country in which acts of violence against the infinitesimally small minority of Christians are a regular occurrence and any perceived criticism of Islam is subject to draconian punishments under the blasphemy law; Asia Bibi was not an isolated case. Father Channan is head of the Peace Center located in the city of Lahore in Pakistan. During a visit to the headquarters of the pontifical charity Aid to the Church in Need (ACN), Father Channan talked about the impact of the blasphemy laws, propitious developments in the Islamic world, and the future prospects of Asia Bibi in an interview with Tobias Lehner. Tobias Lehner: The fate of Asia Bibi has given the world a face to associate with the perilous situation of many Christians in Pakistan. After years on death row, she was acquitted of blasphemy charges in late October 2018 and released from prison. What can you tell us about the current situation? Father James Channan: The situation of the Christians in Pakistan is alarming. They live in fear and uncertainty. This situation has not changed since the 1970s, when legislation in Pakistan began to be based on Islamic Sharia law. Radical Muslims are misusing the controversial blasphemy law in particular to settle personal scores. Anytime, Christians are accused of supposed blasphemy, all Christians in the region are indicted with them. This often leads to acts of violence against Christians. And this is exactly what happened in the case of Asia Bibi. She was on death row for nine years on charges of blasphemy. Even now, after her acquittal, she is anything but safe. Radical Islamists are trying to find her so that they can kill her. That is why she is currently under state protection. We hope that the Supreme Court will soon confirm her acquittal and refuse to grant permission to appeal. Then, hopefully, she will be able to leave the country and live in freedom. Asia Bibi is not an isolated case. What can you tell us about the fate of Christians who are also facing charges of blasphemy? According to a report of the Catholic Bishops’ Conference of Pakistan, there are 224 other cases of Christians since 1984 facing charges of blasphemy, and currently 25. One of these is the case of the married couple Shafqat Masih and Shagufta Bibi. I visited them on death row. They have been accused of sending blasphemous text messages, which the couple denies. Their prospects are very bleak. Even should they be acquitted, they and their children will no longer be able to live in Pakistan. Fanatic Muslims will try to kill them. The blasphemy law destroys the lives of those who have been accused, even if they avoid being executed. Following the acquittal of Asia Bibi we saw pictures of an angry mob that continued to call for her execution. In view of this, is there even a chance of religious freedom for Christians living in Pakistan? It seemed as though at any moment, a group of militant Muslims would bring the entire country to a standstill. However, militant Islam does not hold the majority in Pakistan. The country has a fraction of about 10 to 15 per cent of radical Islamists who are provoking people to violence. The majority of Muslims do not follow these agitators. They are advocates for religious freedom, also for Christians. Both Christians and Muslims were greatly relieved when Pakistani security forces recently arrested more than 1000 Islamists. Cracking down on extremism was the right thing for the government to do. And I hope that this will continue. 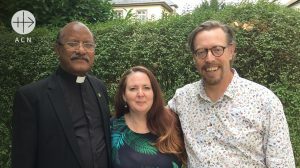 Aid to the Church in Need has been working with you for many years. From a European standpoint, there is little one can do to change the situation. Does the aid actually make a difference for the Christians in Pakistan? The support provided by ACN plays a crucial role in ensuring that the church in Pakistan can continue to proclaim the faith and promote a dialogue. The assistance has allowed us to build many bridges between Christians and Muslims. We want to demonstrate that the different religions have nothing to fear from one another. A large number of Muslim clerics, including the Grand Imam of the second largest mosque in Pakistan, are a fixed part of our programme at the Peace Center in Lahore and close friends. I am convinced that the foundation for a good and peaceful future can only be built by establishing a dialogue between Christians and Muslims. Amanda Griiffin and Mario Bard from ACN-Canada met Father James Channan last September.